I repair dozens of tent zippers every season. Many people seem surprised when their tent zipper fails. Zipper slider failure is extremely common, and it is caused mostly through normal wear and damage. The most common symptom of slider failure is that the zipper coil will not zip closed, or separates at a certain point on the zipper. This is typically an indicator of a worn slider. Worn sliders can easily be replaced, provided they are not an off brand. Damaged (bent) sliders will also exhibit this behavior. Coatings on zipper sliders are not particularly durable and wear down easily. If your tent zipper is not zipping, the slider most likely worn from dirt and grit, or it has been bent from hard use, getting stepped on, being squeezed with pliers, or similar. The whole zipper does not need to be replaced, just the sliders. A good example of how dirty tent coil gets. This tent had been hosed down but they did not hose the zippers out. KEEP YOUR ZIPPERS DIRT, SILT, AND GRIT FREE!!!! Depending on where you camp, shaking/sweeping the tent out may be sufficient. More likely, you will want to clean your tent. Set it up in the yard, and take a hose to it. Do not use any cleaners or brushes. A rag made from an old towel will pull micro dirt off the floor really well. Wipe down the seams and spray the zipper coils with the sprayer. Dry thoroughly. TRAIN YOUR TENT PARTNERS. Do not leave the door lying in the dirt. Watch the kids and the dogs. Open doors fully, do not leave zippers part way open. Roll up the tent door and keep it out of the dirt. DO NOT FORCE ZIPPERS! If there is a fold of fabric caught in the zipper, work to gently free it. You can pull hard enough on the slider to damage the slider, the coil, or tear the fabric. CLEAN YOUR TENT: Hose tent off and let air dry, thoroughly. If tent is gritty, use a sponge or rag to wipe dirt off. Never use a scrub brush, harsh detergent, or put tent in the washer. Pay special attention to hosing off the zippers. Note: I have been hearing good reports from people who have washed tents without detergent in a front loader (non-agitator) machine. I have not tried this myself but you are welcome to experiment. Agitators can tear doors and ties downs, and detergent will strip the waterproofing. YMMV. NEVER PUT A TENT AWAY DAMP: This is the number one cause of mildew, which eats away at the waterproof coating on your tent. There is no fixing mildew. Commonly asked questions about tent care, and a few comments. Lubing zippers? If you want to use a dry lube, McNett sells a zipper lube. Do not use Vaseline or any grease product on the zipper. It’s better just to keep your tent zipper clean and grit free. Re-waterproofing the fly? Both Nikwax and Grangers’ make excellent products to renew waterproofing and/or DWR (Durable Water Repellency). Grangers’ also makes a combination waterproof/UV protector for fabrics. Order from www.mgear.com I have not had good success with “K-kote” but others have tried it. It might be easier to just pitch a blue tarp over the tent if the fly is leaking that bad. Smelly tent? It’s one of two things (unless it got skunked or peed on by a dog): mildew, or hydrolyzation of the polyurethane coating. Neither is fixable. 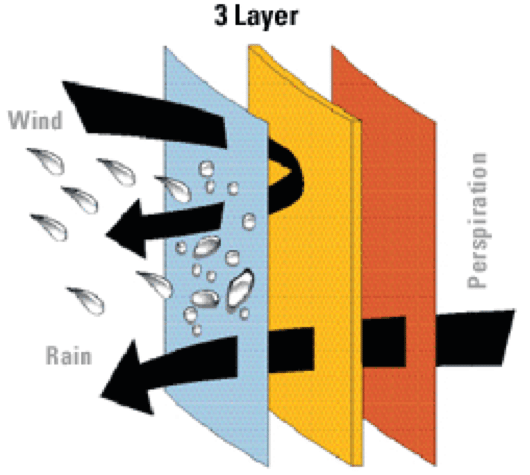 Mildew is from moisture, and hydrolyzing of the PU is due to age and exposure to environmental conditions. Zipper separates when the tent is staked out taut? Don’t stake it so tight. If it is impossible to not stake it taut without a zipper pulling apart, that is a design flaw. A new zipper or a beefier is not going to fix this. Floor leaks? You can try to recoat the floor with K-kote. It is a really messy project and results are iffy at best. My suggestion is to cut a piece of blue tarp the same size as the tent floor and place that down inside the tent. Make a new fly? Absolutely not. If your friend lost the fly when they borrowed the tent, make them buy you a new tent. If “the rest of the tent is in good shape, it’s just the fly that’s old”, the rest of the tent is NOT in good shape; it’s just as old as the fly. The body of the tent may not show the age that the UV-baked fly is showing, but trust me, it’s old. This entry was posted in Fabric Tech, Gear Care, Workroom Musings and tagged dirty tents, how to clean a tent, tent care, tent repair, worn out zippers, zipper sliders on January 13, 2014 by penny. I suppose I should keep a tally but I don’t. 2. Ultralight gear breaking from being ultralight. 3. Dog or other animal ate it. 4. Tore a hole in it. (tree branches #1 cause). 6. Straps pulling out of seams (mostly poor construction, more on this later). 7. Zipper sliders getting squashed. 8. Zippers breaking from dirt and general wear. 9. Zippers breaking from not being threaded correctly at the bottom. Worn plastic on male pin at the bottom of a zipper. Zippers, Velcro and elastic are all fixable, more or less. The rest? Not so much. This entry was posted in Uncategorized, Workroom Musings and tagged gear repair, tent repair on December 31, 2013 by penny. This is the workhorse. I couldn’t do what I do with out it. Silly me, I was advised to get this machine a long time ago, but being a cheapskate I procrastinated for years. I fought with an inappropriate machine for way too long. This is a no-frills needle feed machine. What is a needle feed? The needle “walks” (feeds) as it pierces the fabric, moving the fabric back in conjunction with the feed dogs. This makes for incredibly even feed of varying weights and thicknesses of fabric at any speed. Unlike a walking foot machine, the presser foot does not walk; only the needle does. It does not have an automatic backtack or thread cutter, but that’s fine with me. It has a nice, quiet servo motor. The needle feed has an incredible range. I can sew ripstop to Cordura with webbing. The key is to have the correct needle and thread. Last, for now, but certainly not least is my Singer Featherweight. This machine used to belong to my mother-in-law, who was a very talented quilter. She also taught me to quilt; not like I do much of that lately but that is beside the point. This machine is hugely sentimental for me as it is the only thing of hers I got when she passed. And truthfully, this one belongs to my husband’s sister, but she has given it into my caretaking. There was another one that was to be mine, but…(insert family drama). A funny story about this machine: I brought it up from the SF Bay Area to Washington shortly after 9/11. TSA officials didn’t like this item at all and I was pulled aside for the full meal deal bomb residue wipedown – for a little old lady’s quilting machine. Coming up – more about different industrial machines, and “what machine should I buy”. This entry was posted in Tips for Sewing Your Own Gear, Workroom Musings and tagged entrepeneurs; outdoors sewing, featherweight sewing machines, gear maker tips, gear repair, industrial sewing machines, needle feed sewing machine, tips for sewing your own gear, walking foot on December 17, 2013 by penny. I have the luxury of two sergers. Sergers are a wonderful tool for working with knits and finishing fabrics. This Babylock may qualify as an antique. It certainly is of the first generation of sergers that came out for home use. I purchased it in 1987 and it still going strong. I’ve probably used it on hundreds of fleece items at this point. It is a 2/3/4 serger in that it will do 2-thread rolled hem, and both a 3- and 4-thread stretch seam/edge finish. What is a cover stitch? It hems and finishes all at once. This machine has been invaluable for professional looking finishes on stretch items, softshells, fleece and more. This serger also does everything the Babylock does, but I keep it set up just for coverstitching. I don’t use this machine tons, but I am glad I have it for the results it can produce. This entry was posted in Tips for Sewing Your Own Gear, Workroom Musings and tagged entrepeneurs; outdoors sewing, gear maker tips, lycra, tips for sewing your own gear on November 25, 2013 by penny. I get asked a lot about what machine to use or buy, and what machines I have. I confess I have amassed somewhat of a collection over the years. Some I use more, some I use less. I have pretty much run out of room to add anything new to the stable. There are some specialty machines that I would love to have, but needed something three times a years doesn’t necessarily justify the expense or the space. Bernina 1130. I purchased this machine in 1987 to replace a Viking 6000 that I burned the motor up on. For many years, this machine has done almost everything I have asked of it. It is limited by speed, and for heavy fabrics both by piercing power and the inability to run heavy thread. However, it is incredibly precise with beautiful stitches. I love the “needle-down” function, the ability to one stitch at a time, and the buttonhole. I don’t use it nearly as much as I used to, but for precision work, button holes and certain repairs it is still very handy. It has even survived lightning strikes to the tune of $300 in circuit board replacement. This Rex walking foot has been a shop mainstay for many years. I purchased it out of the nickel ads 15 years ago. It was a true “driven on Sunday by a little old lady” find. While the foot is not as high lift as some other walking feet machines out there, it will handle just about anything tough I can stuff under the foot. It lacks real speed, and is not suitable for lighter fabrics. This video illustrates exactly what a walking foot aka compound feed machine does. Additionally, it is designed to run heavy thread and use big needles. Nowadays I use it primarily for repairs involving packs and heavy materials. More about the rest of my machines soon! This entry was posted in Workroom Musings and tagged entrepeneurs; outdoors sewing, gear maker tips, walking foot on November 13, 2013 by penny. When I was working on the new site, my graphics guy asked me, “why is keeping the Tips section so important to you?” The reply was simple: it’s not my information to hoard. Since the beginning of Specialty Outdoors, that has been my philosophy. Competition doesn’t concern me: I would much rather respect and support my professional peers, sharing a few tricks here and there, instead of worrying about whether they might steal ideas or customers. Heaven forbid helping the enthusiastic hobbyist to success with a project! Here’s why I don’t hoard information. First of all, it’s not rocket science. It’s more a hammer-and-nail scenario. Most of my information I have either found online, in books, or through generous mentors and others willing to answer my questions. They weren’t hoarding: they gave it freely where they thought it could be used, and I do the same. Sharing information was the very first lesson I learned when I got online back in… 90-something. I ventured onto Usenet, (rec.backcountry) posted my services, and was immediately and thoroughly flamed for advertising on a non-commercial board. Oops. I didn’t know any better as I had read about Usenet in Better Homes and Gardens, of all places. Anyway, some kind soul, and to this day I do not know who it was, emailed me and let me know that the way in was to participate. So I did – advice on repairing gear, cleaning gear, where to find fabrics and other tips, with a one line signature. It has been been fun being a resource, and of course people think of me when it’s out of their comfort zone to do some work. But – I’m not going to do your homework for you. Please, don’t be lazy as it’s a real turn off. The most common example is someone who wants to do small scale manufacturing, finds me online, and wants me to tell them everything I know so that they can get started. Here’s what I tell them: You need this book. I read it to get informed, and they can too. The author, Kathleen Fasanella, shares her knowledge freely and tirelessly. Don’t email me asking where to get something. That is why there is a sources page! Kathleen and many others have been great role models and mentors to me. I am forever thankful, and do my best to carry on the tradition. Thank you to Kathleen, Joe, Judith, Kevin, Patrick, Patrick and Greg… the range of knowledge you have shared with me has been immense and I am ever grateful. This entry was posted in Workroom Musings and tagged entrepeneurs; outdoors sewing, Kathleen Fasanella, rec.backcountry, sourcing outdoors fabric, tips for sewing your own gear, usenet on October 22, 2013 by penny. On the old site, I had a page about waterproof breathable fabrics. It was an attempt to decode the technical jargon and explain the differences in the various types of waterproof breathable fabrics. Two-layer? Three-layer? Monolithic coatings? It’s very overwhelming for we fabric tech people, much less the lay person. Instead of trying to explain all this myself in a new, updated article, I am sharing this excellent article that is current and does a fantastic job of cutting through the BS and obfuscation that surrounds fabric technology. Even if you are like me and all the tech-speak starts to sound like Charlie Brown’s teacher (“wrrrrrr-wrrrrrr-wrrrr”), this one is highly readable. The following article comes from Blister Gear Review, an independent adventure sport website whose mission is to publish the most in-depth and honest gear reviews on the planet. I really like this blog for its non-nonsense, real world reviews. My original intent was to reprint the article here, but at 5+ pages with images it’s easier to link. This article is a “must read” if you have any interest at all in understanding the technology that drives outerwear design and technical fabric development and use. Here is an important question when purchasing a shell: 2 Layer or 3 Layer? And does it really matter? 2L garments are constructed with two layers; a nylon face fabric (generally with a DWR) that is bonded to a WP/BR laminate. 2L garments are always lined with some sort of lining fabric. These linings are generally made of thin nylon or mesh, and serve two purposes. First, the lining keeps the laminate from direct contact with the skin. This is important because the laminate generally has a plastic feel to it and can be quite uncomfortable. The lining’s main purpose, however, is to protect the laminate. Even though the laminates are engineered to be resistant to fouling, without further protection of the laminate, its durability can suffer greatly. 2L garments are generally constructed with some amount of seam taping. Seam taping keeps water and wind out at the seams, but does not breathe. 2L outerwear dominates the market for many reasons. 2L construction lends itself quite well to making insulating garments, which dominate the consumer market. (People want their coats to be warm. Who knew?) 2L construction is also less expensive because the technology has been around much longer. The construction of the garments is easier because the lining allows many sewing options with less need for seam taping, and the design is easier because of the ability to work with a lining. 3L – Or, Why does this jacket cost $600??? 3L garments are constructed with 3 layers: (1) a nylon face fabric (with a DWR) that is bonded to (2) a WP/BR laminate, which is bonded to (3) a tricot layer on the inside. 3L construction: Blue = nylon face; Yellow = WP/BR laminate; Orange = tricot liner. 3L garments are not constructed with a lining and are therefore often shells. 3L pieces generally use the most advanced (and therefore expensive) fabrics and laminates. These fabrics make up some of the most technical pieces of outerwear available. Construction of 3L garments is difficult. Every seam has to be taped or welded, and every cut greatly modifies the look of the garment. Given that both seam taping and the fabric are extremely expensive, and construction is difficult, 3L garments can be costly pieces of outerwear. So why bother to make (or buy) a 3L jacket, when you could just produce or purchase a 2L jacket? There are a few reasons why 3L construction has gained a lot of momentum in the industry lately. First is performance: the addition of the bonded tricot liner increases the breathability of the garment. The tricot is hydrophilic and, as you sweat, the tricot preferentially absorbs your sweat and transports it to the laminate so it can diffuse out. Contrast this with a 2L garment, where the water vapor has to randomly bump into the laminate while navigating between your skin and the lining to diffuse out. The next advantage is weight. 3L garments can be made without a lining, and therefore, save a substantial amount of weight when compared to their 2L counterparts. The final advantage is the durability of 3L construction. The addition of the tricot liner adds a significant amount of support and protection for the laminate that is not present in a 2L garment. In short, a 3L garment will have better performance, with less weight, and be more durable than a comparable 2L design—albeit at about twice the cost. 2.5L – Or, What in the hell is a half a layer? This is not a very common construction in the world of winter outerwear, but it is a common source of confusion, so we’ll briefly touch on it. A 2.5L fabric is made up of two and half layers—sort of. It has a nylon face fabric (with a DWR), a WP/BR laminate, and then a printed lining. This printed lining is present for the sake of protecting the laminate, but does little to eliminate the clammy, plastic feeling of the laminate directly on the skin; hence the designation of a half of a layer. 2.5L fabrics are used on active rainwear because they are easier to produce and end up being lighter than 3L garments, though less comfortable. This entry was posted in Fabric Tech, Workroom Musings and tagged abut DWR, DWR, Gore-tex, Goretex, waterproof breathable fabric, waterproof breathable fabrics on September 20, 2013 by penny. I get asked a lot, “how did you get into this”? I’ve been sewing my whole life, starting with little blankets for my Breyer horses. I was first exposed to the outdoors industry working for Pat Smith and MountainSmith in 1983 when he was still in his garage and made the move to the first facility. There, I was a jill-of-all-trades batching packs for the sewers, inspecting packs, shipping and almost anything else. This was my first exposure to entrepreneurship, outdoors goods, industrial machines and production. I cobbled together most of an apparel design degree but did not complete it due to life happening. I spent a lot of years doing custom clothing and bridal. When we moved to Spokane it was a great opportunity to quit that niche. Honestly, as a jeans-coated-with-dog-hair kind of gal, and piles of gear all over the place, it never was a good fit. In the meantime, I was rummaging through the back tables in fabric stores as the first fleeces were just starting to come out. A few patterns became available and I was able to outfit my husband and little boys with fleece garments. Adult fleece garments were spendy, and there was nothing for kids. In my quest to make affordable gear, I began to reverse engineer, tweak, and search out information that was not obvious for the home sewer. This was noticed in the community, and a guy said to me, “you should be repairing gear”. What a great idea! Spokane is the kind of place where small businesses are supported by the community, and we have a very active outdoors community here. It wasn’t long at all before I was getting known as “The Zipper Lady”. I got the bright idea to build a website in ’97 or so, and established an online presence. Back then it was easy: hand code some HTML, add some links and voila`: a website is born. I had read about Usenet in a women’s magazine and I sought out rec.backcountry. My Usenet newbie “hello, I can fix your gear” post did not go over well, and the trolls had a field day. I do not remember who it was, but I am ever grateful to the kind soul who emailed me and gently explained the Usenet faux pas I had made and let me know the correct way to (non) advertise on a non-commercial newsgroup. The key was participation and a one line signature, so that’s what I did. I helped people do their own repairs, told them where to find materials, advised them on gear care, and in return, they called on me when it was time for a pro. In addition, I was for many years a moderator and participant in the Gear Makers forum at the Backpacking.net site. Throughout all this, the work started coming in. Whether it was a referral from a website, friend-of-a-friend, search engine, an outdoors club, or a referral from a manufacturer I confess I never kept track after I got to 45/50 states and some international work. I now have arrangements with local stores to collect local work, in addition to contract work and all the great folks that somehow find me. I’ve never consciously advertised, but I do believe that the willingness to share information and help other when I can contributes to things coming my way. This leads me to thoughts on hoarding information, which will be posted another day. This entry was posted in Workroom Musings and tagged classic backpacking gear, entrepeneurs; outdoors sewing, gear maker tips, rec.backcountry, usenet on August 21, 2013 by penny.